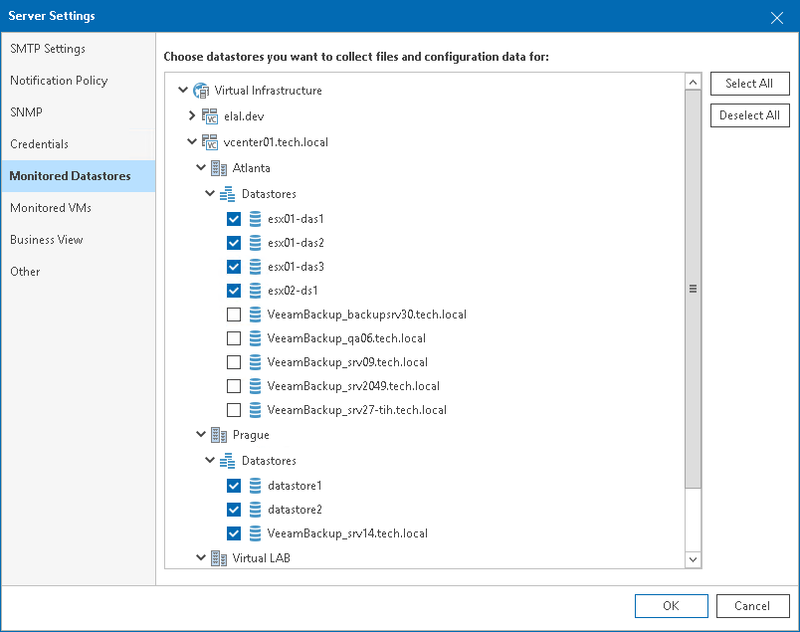 After you connect a VMware vSphere server in Veeam ONE Monitor, all datastores attached to this server are added to the data collection scope. If you do not need to collect data about specific datastores (for example, local datastores or datastores with ISO images), you can exclude these datastores from the collection scope. Excluding datastores will accelerate completion of a data collection sessions. Excluded datastores will not be reflected in reports that analyze and list the files residing on datastores (such as the Garbage Files and Idle Templates reports). Excluding datastores available for the VMware vSphere platform only. Click Options on the toolbar and choose Server Settings. In the Server Settings window, open the Monitored Datastores tab. Expand the virtual infrastructure hierarchy and clear check boxes next to datastores that must be excluded from the data collection scope.